Prognostic factors are useful in order to identify early-stage breast cancer patients who might benefit from adjuvant treatment. The metastasis-promoting protein S100A4 has previously been associated with poor prognosis in breast cancer patients. The protein is expressed in diverse subcellular compartments, including the cytoplasm, extracellular space, and nucleus. Nuclear expression is an independent predictor of poor outcome in several cancer types, but the significance of subcellular expression has not yet been assessed in breast cancer. 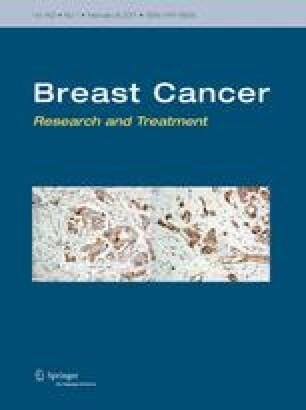 Nuclear and cytoplasmic expression of S100A4 was assessed by immunohistochemistry in prospectively collected tumor samples from early-stage breast cancer patients using tissue microarrays. In patients not receiving adjuvant systemic therapy, nuclear or cytoplasmic expression was found in 44/291 tumors (15%). Expression of either nuclear or cytoplasmic S100A4 was associated with histological grade III, triple-negative subtype, and Ki-67-expression. Patients with S100A4-positive tumors had inferior metastasis-free and overall survival compared to S100A4-negative. When expression was analyzed separately, nuclear S100A4 was a significant predictor of outcome, while cytoplasmic was not. In patients who received adjuvant treatment 23/300 tumors (8%) were S100A4-positive, but no tumors displayed nuclear staining alone. S100A4-expression was strongly associated with histological grade III and triple-negative subtype. Although not significant, metastasis-free and overall survival was numerically reduced in patients with S100A4-positive tumors. S100A4-expression was associated with poor outcome in early-stage breast cancer, but the low percentage of positive tumors and the modest survival differences imply that the clinical utility in selection of patients for adjuvant treatment is limited. Eivind Valen Egeland and Kjetil Boye have contributed equally to this work. The online version of this article (doi: 10.1007/s10549-016-4096-1) contains supplementary material, which is available to authorized users. We would like to thank Elisabeth Emilsen for excellent technical assistance. This work was supported by the Cancer Society of Norway (Project no [#4218523581] to EVE). Torill Sauer, Jürgen Geisler, Solveig Hofvind, Tone F Bathen, Elin Borgen, Anne‐Lise Børresen‐Dale, Olav Engebråten, Øystein Fodstad, Øystein Garred, Gry A Geitvik, Rolf Kåresen, Bjørn Naume, Gunhild M Mælandsmo, Hege G Russnes, Ellen Schlichting, Therese Sørlie, Ole C Lingjærde, Vessela N Kristensen, Kristine K Sahlberg, Helle K Skjerven, Britt Fritzman. The project was approved by the Regional Ethics Committee of South-East Norway, and all procedures performed were in accordance with their ethical standards and with the 1964 Helsinki declaration and its later amendments. Written informed consent was obtained from all patients enrolled in the study.